Connecticut’s new year started off cold, blustery and uncomfortable — and the weather was really bad, too. There was conflict on many fronts, beginning with the decision to stop admitting new inmates to the state’s only juvenile prison for young males; and, of course, over the state’s ongoing fiscal problems. Thursday’s “bomb cyclone” snowstorm shut down the entire state, but only put off the issues for a day. The legislature’s overall struggle to fashion and ultimately pass a budget has not inspired confidence in State Treasurer Denise Nappier, who said she fears the governing body may not have the fiscal discipline necessary to properly handle Connecticut’s huge retirement benefits liability. In any event, the problem will not be hers much longer. She announced her decision to retire after five terms in office; and with the departure of the state’s only black constitutional officer, new questions about balancing future Democratic tickets arise. The money worries don’t stop with Nappier, of course. Connecticut’s top education officials say they cannot honor the governor’s request for more places to cut state education spending without jeopardizing the state’s position with respect to a court finding that its school aid distribution is irrational and unconstitutional. The Department of Education made some progress on behalf of expelled students, though, by setting standards for alternative education they must receive while not in school. Meanwhile, in Washington, Connecticut’s senators were fuming over what they see as the federal government’s inadequate response to the hurricane damage in Puerto Rico. Sens. Richard Blumenthal and Chris Murphy spent two days there. After a visit to a Connecticut relief center for victims of the Caribbean hurricane, Malloy was also critical of the Trump administration’s response. 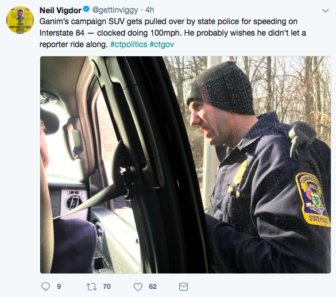 Elsewhere on the political front, Bridgeport Mayor Joe Ganim’s campaign for governor got off to a fast start, so to speak, when a city police officer driving him to a campaign event got pulled over for doing 87 miles per hour in a 55 mph zone — with a reporter in the car. The big news in Washington, of course, was the release of Michael Wolff’s inside-the-White House look at President Trump, who he describes as “incapable of functioning in his job.” U.S. Rep. Rosa DeLauro may have some questions in that area, considering she has invited a forensic psychiatrist to speak to her and fellow lawmakers about the president’s mental health.